All that was needed was to buy some Cornish raspberries from our local greengrocer – mmmm. As I’d been sent some flour and sugar for the event, I tried to do as little tinkering as possible. So instead of using wholemeal flour as I normally would for brownies, I used plain white Allinson flour instead. My eggs were duck eggs, so larger than the eggs meant for the recipe, but extra egg is by no means a bad thing in a cake. I’d been sent some Billington’s golden caster sugar, which is the standard one I use anyway, so felt justified in using the vanilla sugar I always keep on standby (a couple of vanilla pods in a jar of golden caster sugar, that gets refilled as soon as it is used). The only real change I made was to the name. In my book, brownies are made with dark chocolate not white. These cakes, made with white chocolate and including white chocolate chips too, are most definitely blondies. Melted 115g unsalted butter in a pan over gently heat. Turned off the heat and added 100g of chopped vanillary white chocolate (I used G&B). Stirred until more or less combined. Whisked 2 duck eggs (can use large hens eggs) with 115g vanilla sugar (golden caster) until thick and frothy. Folded in the chocolate mixture followed by 125g of sieved plain white flour. Gently stirred in 125g raspberries and 60g white chocolate chips. Scraped the batter into a 7″ sq. silicone cake mould. Scattered 40g white chocolate chips over the top and placed 12 raspberries onto what I imagined the middle of each future piece was going to be. Baked for 30 minutes at 180℃ until the cake was risen, golden and firm to the touch with just a slight wobble underneath. Allowed to cool in the mould then cut into 12 pieces. Oh my days, these were good. They were perhaps a little cakier than I normally like my brownies and blondies to be, but robust enough for transporting to, and eating at, a picnic. As predicted the tart raspberries provided a delightful contrast to the sweet vanillary cake and the crunchy bits of caramelised white chocolate just added to the fun. When choosing this recipe, I also had Tea Time Treats very much in mind, which is all about picnics. This month’s theme was chosen by Karen of Lavender and Lovage. This blogger event is co-hosted by Janie of The Hedge Combers. Using local Cornish raspberries in these blondes makes this post just right for Shop Local over at Elizabeth’s Kitchen Diary. They look delicious, I love raspberries and white chocolate together. Just gorgeous. Thanks Emma, it’s a good combination. Raspberries and white chocolate are the perfect combination. These look so good! These will definitely appeal to my son. So I’ll have to keep a note of this for the next time he travels over to us. Fresh raspberries never looked so pretty! These would be delicious with a cup of tea! I’m tempted to make these for my co-workers. I haven’t baked for them in a while! These look gorgeous! Raspberry and white chocolate is one of my favourite flavour combinations. I love how deep your blondies look too. Perfect for a greedy blondie eater like me! These look so good. I bet the raspberries are a wonderful contrast to the sweet white chocolate – yum! Thanks Vanesther, I really like the contrast between tart fruit and sweet cake. Sweet and sour is a classic combination after all. really really cute and perfect for snacking on the move… love that you must get that shock of the tart raspberry with the over-sweet white chocolate… gorgeous! Thanks Dom – trouble is, they are just perfect for snacking on full stop! Oh I do like blondies, but I’ve never had them with raspberries. Gorgeous! Jac you must try them with raspberries – they add a whole new wonderful dimension. White chocolate is one of my all time favourite combinations too. And blondies are so scrumptious! 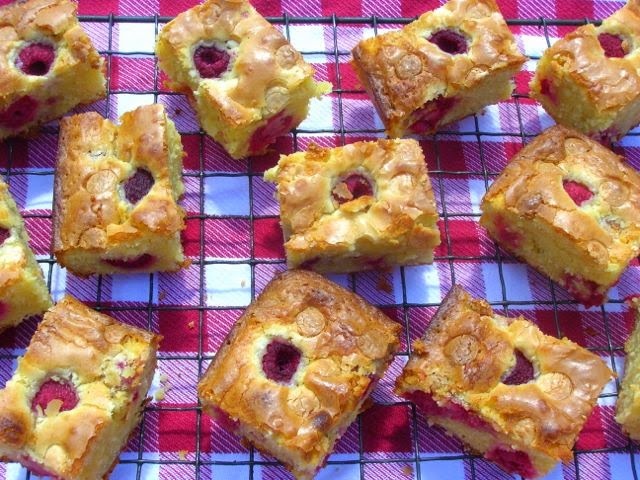 Those Cornish raspberries look perfectly formed and are so cute poking out of the top of the blondie slices……. Thanks Kate – I so miss not having our own raspberries. Just hope we have a good autumn so the raspberries just keep on coming. They are luscious and divine. White chocolate and raspberries are indeed a great pairing. Thank you Angie – if only the white chocolate was as good for us as the raspberries! It’s taken me a long time but in recent years I’ve come to realise that freshly picked raspberries are right up there in the list of my favourite foods. You’ve certainly done them justice in these blondies. Eating these on a Cornish beach on a summer’s day sounds like a slice of heaven. Thanks Phil. It’s a funny thing about raspberries – they must be more of an adult food – perhaps it’s the tartness. I too have grown to love them – it was all about strawberries when I was younger. These sound so delicious – love the flavour combination! I bet they’d be amazing with an afternoon cuppa 🙂 Thanks for linking up with Shop Local! A great flavour combination indeed Elizabeth. I just heard on the radio that tomorrow is the last day for picking raspberries – I’m not sure where they mean, but it’s not down here in damp Cornwall. I am with you on the nomenclature of brownies. These are most definitely blondes! I could do with a piece just now with a cuppa. It’s soggy and dreich up here in Edinburgh and these would so cheer me up. Lovely recipe. I suppose now (September we could make these with brambles. What a lovely idea, blackberries would give these a gorgeous colour Kellie. I was looking for a Halloween pumpkin recipe and now am stuck on your blog looking at these blondies with two of my favourite foods in the world! Raspberries and White Chocolate. Can’t wait to try out this recipe. Thanks Mandi, I’m very happy for you to be stuck here – you’ll find plenty to eat anyway 😉 I do have a few pumpkin recipes and they aren’t all sweet.